SALT (Spinsat Altimeter) follow on mission to Geosat, using the altimeter of the cancelled N-ROSS mission, was awarded in April 1989 to Intraspace Corp. It was to be a part of US Navy's Spinsat (Special Purpose Inexpensive Satellite) small satellite series. SALT was intended to demonstrate the feasibility of using small, inexpensive satellites for ocean monitoring. 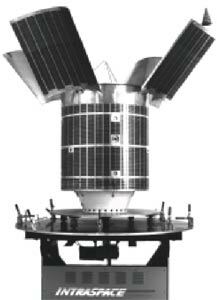 SALT's would have carried the 1 million Dollar solid-state single frequency C-band active microwave altimeter designed and made by the Applied Physics Laboratory of Johns Hopkins University for N-ROSS for measuring wave heights with an accuracy of 0.5 m.
The Scout-G1 launch vehicle would have placed SALT into a 200 km × 600 km transfer orbit, fom where it would have maneuvered itself into a 800 km circular orbit with an inclination of 108°. The American Rocket Company (AMROC) was supplying a hybrid rocket motor to raise the Bus to the desired altitude and provide for inclination correction. Thrust vector control was to be provided by a rapid response gimbal system with the entire motor, rather than just the nozzle. The launch was planned for March 1990, but project cancellation before the satellite was completed prevented this. Finally in 1998 GFO was launched as a Geosat replacement.